Einstein wanted to find his ticket so he could remind himself where he was headed. I opened my talk tonight with that story, because sometimes it isn’t good enough to know where you are, or even who you are. You also have to know where you’re going. So in the spirit of Albert Einstein, I would like to say a few words to you this evening about where you are going. But first of all, let me say that it is a pleasure to be able to address the graduating class this evening. What you have been given during your years of classical education at this institution is a gift you should treasure all your life. Treasure this gift in gratitude for the teachers, administrators, parents—and in some cases, grandparents—who made this education possible for you. So, where have you been, and where are you going? You have been at a school that values something called “classical Christian education.” Widespread confusion exists about what this term even means. In the last twenty years, classical education has become trendy, but in the process it is easy to lose sight of the core values that inform this type of educational approach. Whatever else we might say, classical education—both in its ancient and modern application—has been understood to be about the cultivation of virtue. Now “virtue” is as misunderstood today as classical education. One of the worst misunderstandings of modern Christianity is the legalistic reduction of virtue to mere action. In the historic classical tradition, however, virtue was understood to be about having correct dispositions, and cultivating mental and physical habits that will foster rightly ordered attitudes at the deepest core of our being. Lewis is saying that in the historic understanding, while virtue includes action, it involves so much more and is rooted in attitude. And while attitude includes emotion, it also involves so much more, namely having dispositions tuned to reality in a special sort of way. To have virtuous attitudes is to be the sort of person who is nourished by beauty instead of triviality, who instinctively has a fitting response to what is lovely and awe-inspiring. To have virtuous attitudes is to have a disposition that instinctively recoils from what is base and disgusting. It is to be able to go out into the world with a sense of wonder towards all that is lovely and awe-inspiring, and to derive genuine enjoyment from what is good, true and beautiful. Given the nominalist presuppositions of the modern age, it is easy to fall into the trap of thinking that there are some attitudes and desires that God simply declares to be right, while there are other attitudes and desires that God declares to be wrong. But Lewis’s point in The Abolition of Man is that there is an internal grammar to how the world is which assures us that certain attitudes, desires and even emotions are more congruent to objective reality than other sorts. This challenges us to rethink the nature of emotion. In our culture, the main distinctions we tend to make about emotion is between those which are pleasant vs. those that are unpleasant, with the assumption that the former should be cultivated and the latter avoided. Needless to say, this assumption lies behind so much of the substance abuse, immorality and destructive habits that have become commonplace in today’s world. The historic Christian approach is to think about emotions that are rightly ordered vs. emotions that are disordered. Some rightly ordered emotions can be pleasant or unpleasant, just as some disordered emotions can be either pleasant or unpleasant. Aristotle taught that properly ordered emotions play an integral role in correct thinking as well as in helping a person’s appetites be regulated by virtue. For the philosopher, emotion is a type of perception—an “appearing as”— that undergirds moral thinking and decision making. For example, we feel anger when we witness an action that appears unjust, or we feel pity when we see someone suffer from evil. The emotion follows from how reality appears to us. Qualities like courage, friendship, moderation, loyalty, generosity and so forth, can be called virtues in so far as they are oriented towards rightly-ordered ends, which is to say congruent with a right perception of how reality actually is, and from these virtues follow certain emotional responses. But it is also possible to experience disordered emotion rooted in a perception of the world lacking in virtue, as would be the case if I felt envy at the good fortune of another, or satisfaction when my enemy suffers pain. The goal of education, especially the education of children, is to cultivate proper habits, including the habit of responding to situations with the right emotional response. What a person gets angry about, what makes someone sad or ashamed, what causes grief, what a person loves—these are all conditioned by how we see the world, and how we perceive the world at the centermost core of our being, which is, at least partly, a matter of how we have been educated. Without properly ordered emotions, it is impossible to achieve eudaimonia, a Greek word that is often translated happiness but more properly conveys the idea of human flourishing. The teaching of Church Fathers like St. John Chrysostom have much affinity with Aristotle since they urge us to approach our emotions with the question, “Are these emotions rightly ordered? Are they based on a correct perception of reality?” The spiritual life does not involve eliminating painful emotions, but becoming the type of person whose emotional life is rightly ordered. St. John wrote a lot about this towards the end of his life. But this is precisely why the rationalist paradigm of education—which treats students as mere information receptacles—is so wrong. Why, as educators and parents, have we worked to expose your minds to the best literature and the finest music? Why do we strive to cultivate rationality and a well-ordered intellect through the study of history, mathematics and the language arts? Why do we encourage inquisitively towards the natural world through the sciences? Whatever subsidiary purposes education may serve, all these endeavors have ultimately been about helping you to cultivate correct dispositions—dispositions aligned with the structure of how reality is. And this, I have suggested, includes an emotional component, as we aim to foster rightly-ordered attitudes and affections. The legalistic understanding of virtue as mere right behavior fails to take into account that both the moral corruption of the individual as well as the moral corruption of society as a whole, are both preceded by a corrupting of sentiments, in which good and noble things start to serve as idols. To address these idols, you need more than simply correct behavior, as if virtue involved little more than trying harder to stop sinning, and you also need more than merely a “Christian worldview”, in the truncated and overly-cerebral sense that the phrase is often used. Rather, the answer to idolatrous sentiment is a type of virtuous sentiment that instinctively perceives idolatry as a misfit, as a departure from nature. The internal sensor of a well-educated student perceives the misfit when knowledge is corrupted into mere data, when thought is corrupted into calculation, when Patriotism is corrupted into blind obedience, when beauty is corrupted into sentimentalism and romanticism, when courage is corrupted into bravado, when compassion is corrupted into tolerance, and when love is corrupted into lust. In The Abolition of Man, Lewis suggested that this process of training a student’s deepest dispositions occurs even before a child has learned to reason, as he or she is nourished in the right attitudes. Cultivating correct dispositions is hard work and requires years of right habits—habits that may seem drudgery at the time but which have as their reward becoming a certain sort of person. It’s easy to misunderstand the nature of this type of reward, since often the rewards we receive from hard work have no organic connection to the labor. For example, when I tell my son I will pay him $5.00 after he has mowed the lawn, or when I tell my daughter we will go to the lake after she has cleaned her room, there is no natural connection to the work and the reward. But sometimes we do experience rewards that are organically connected to our labors. For example, the enjoyment of reading Virgil in the original Latin is organically related to the work of learning to appreciate good literature and studying Latin grammar. The enjoyment derived from stillness is organically connected to the work involved in cultivating habits of attentiveness. The enjoyment a man derives from having a relationship with a modest virtuous woman is organically related to the work of becoming virtuous himself. One who has not worked to appreciate good literature may puzzle why another would prefer Virgil over comics, just as one who has not worked to cultivate attentiveness may puzzle to see another enjoying stillness; or a man who has not worked to cultivate virtue in himself may find it hard to understand why someone would enjoy having a relationship with a modest virtuous woman. The life of virtue determines not simply what we ought to do, but what we will enjoy. We imagine that our tastes, desires, passions, and aesthetic preferences come to us naturally, whereas in reality they are the culmination habits built up over a lifetime, beginning in our earliest educational formation. So when we say that education is its own reward, we mean that becoming a certain sort of person—a person with well-ordered habits, a person with dispositions attuned to reality, a person of gentle heart and rightly ordered affections—becoming that sort of person is the natural reward of our formative educational habits. And this includes habits that may not seem particularly educational at the time. Consider, why do our parents insist that we do things like make our beds every morning, do our chores in the afternoon, listen to good quality music and practice daily spiritual disciplines like prayer and Bible reading? Why do our teachers insist that we conjugate verbs, practice scales on our instruments and diagram sentences? The real value of these good habits is that they orient us towards the end of rightly ordered attitudes—ultimately, being able to recognize what is lovely, being able to be attracted to what is right, and being able to derive genuine enjoyment from what is good, true and beautiful. The disposition of our attitudes—what we find beautiful, what we find attractive and what we enjoy—is formed through years of right habits, including habits that may seem humdrum and monotonous at the time. Through virtuous habits, our hearts are ultimately prepared for the rewards of heaven. Often we misunderstand the nature of future reward and to reduce it to something like, “be good and then God will reward you with the enjoyment of heaven.” But building on what I shared earlier about rewards that are intrinsic to the labor that earned them, a better way to think about future rewards is that our aim is to become the sort of person who will be capable of enjoy God’s presence eternally. To return to my earlier example: just as the enjoyment a man derives from having a relationship with a modest virtuous woman is organically related to the work of becoming virtuous himself, so the unfathomable joy of being united eternally with Christ is organically related to our present-day struggles to grow closer to Him. By growing deeper in our relationship with Christ through habits of virtue, we gradually become the type of man or woman with a disposition that can enjoy Christ’s presence, both in this life and eternally. We all long for Christ’s presence, for the beatific vision. We long for Him like flowers stretching forth towards the light of the sun, for it is in our nature as human beings to aim towards what is good, true and beautiful, and all goodness, truth and beauty is but a dim reflection of the Creator. But the impulse towards the good can misfire, as we follow after merely transitory and temporal goods rather than the Eternal Good, or as we pursue the fleeting ephemeral beauty of this world that cannot satisfy the soul. The power transitory goods have for enticing us away from the Ultimate Good lies precisely in the fact that they are genuine goods. Because of our fallen state, we do not approach God directly, but through the good things of creation. For example, the sense of wonder and awe we feel when contemplating objects of beauty prepares our hearts for the beauty of Christ; the sense of completion we feel when we love and are loved by another prepares our hearts for unity with God; when we experience human forgiveness, understanding compassion and encouragement, these qualities become icons of God’s love for us. The temptation, however, is to treat these things of creation (which, though good, are still transient goods) as if they are ultimate ends themselves rather than means towards the One who is Ultimate Good. Education should thus serve the dual purpose of both cultivating dispositions attuned to what is good, true and beautiful in this world, while also cultivating a sense of holy discontent that refuses to be satisfied with anything but God Himself. The manifestation of what is good, true and beautiful in creation should be seen as an icon of the Eternal Good, the Eternal Truth, and the Eternal Beauty, but it is only an icon; the reality towards which these qualities point can be found only in the beatific vision of God. That is why the best art, the most beautiful poetry, the most lovely music, the most moving literature should leave us slightly unsatisfied; it points beyond itself and awaken within us longings for something more. I realize I am talking about some very lofty matters and some high educational goals. And no doubt the ideals I am describing have only been partially and imperfectly realized in the education you have attained so far. But the real reason I have spoken at length about the educational goal is because your real education begins now. Remember, I explained at the beginning that I would be telling you where you were headed? When you truly understand the nature and telos of education, you can understand not simply where you’ve been, but also where you are going, as you continue now in the same direction. By its very nature, formal education can only give you a glimpse of where you need to go; it can nudge you in the right direction, but it is up to you to go out from here and lay hold of the vision. It is a project I hope you will be embarked upon all your life. The choices you go out from here and make, the material you expose your imagination to, the attitudes and habits you cultivate through thousands of little choices you make every day—all these will ultimately determine what you enjoy, what types of things you desire, and what rival visions of the Good Life you will or will not allow to be nourished in your heart. Think of virtuous habits like armor to protect you from the rival visions of the Good Life. Through our culture’s media, advertising and entertainment industries, we are constantly assaulted with rival images of what it means to flourish as a human being. Jamie Smith has done a good job of showing that these rival visions of the Good Life appeal to our hearts at the level of gut instinct; they appeal to the emotional component of our being. One of the problems with conceiving virtue legalistically—in terms of rules and commands rather rightly-ordered affections—is that we create a dangerous vacuum in the affective side of our being, leaving us unguarded against these rival visions of what it means to flourish as a man or woman. One of the most pervasive competitors against the Christian understanding of flourishing is the notion that the Good Life is found in personal happiness. For the Greek philosopher Aristotle, as well as for many philosophers and theologians throughout the Middle Ages, “happiness” meant something very different to the contemporary meaning. For them, happiness was not conceived as a subjective state of mind associated with pleasurable sensations, but something more akin to Christ’s use of the term “blessed” in His sermon on the mount. Happiness was about living a life oriented towards virtuous goals. But for modern man, happiness has come to be associated with little more than a subjective state, a pleasurable feeling detached from any objective reference point. The false promise of this type of transitory happiness is often held out graduates when they finish high school. I’ve sat through graduation addresses at schools where I hear practical charges like, “you’re so special that you deserve to go out and have fun,” or “pursue your dreams and everything else will fall into place.” It always bothers me when I hear things like that, because it is setting the students up for failure. Given the type of world in which we live, few of us can ever fully attain these hedonistic goals, and those who have been properly educated would not wish to. In the spirit of C.S. Lewis, I urge you not to seek a life of happiness, but instead to seek a life of meaning. I am using “meaning” in the sense that Viktor Frankl (1905-1997) described in his classic book Man’s Search For Meaning. Frankl was an Austrian psychiatrist who lived in the Auschwitz concentration camp during the second World War, and later wrote about his experiences. One of Frankl’s central insights was that a sense of meaning is more fundamental to mental and physical wellbeing than happiness. Drawing on his experiences in the death camps, he shared that while unfavorable circumstances could remove from certain people the possibility of happiness, an inner sense of meaning could never be taken away from those prisoners who determined to cling to it. In many cases, he found that external suffering may even help increase the meaning in a person’s life. Frankl argued that inner meaning comes in many different forms for people. In the death camps, some people realized a higher meaning in the choice to accept their suffering instead of escaping into a condition of numbness and passivity. For some, spiritual freedom came in their refusal to give up hope, even when the likelihood of ever surviving the war seemed very slim. For still others, meaning was realized in the decision to pour one’s last ounce of life into service to others. For others, meaning could be attained by choosing to practice gratitude, including thankfulness for little things we usually take for granted. For example, conditions of extreme deprivation enabled some prisoners to turn little things—such as a colorful sunset or memories of loved ones—into occasions of profound gratitude. In each case, Frankl saw that the ability to accept suffering with dignity and spiritual integrity, and the ability to find a higher meaning in and through the confusion and agony, could determine whether a prisoner shriveled up and died, or whether he continued to live. Being able to tap into inner resources of meaning was even more predictive of whether a prisoner would survive than the physical condition of that person upon entering the camp. Frankl’s message is that the quality of our life depends, not on everything working out well for us, but on our “will to meaning”—the determination to find meaning, purpose and significance through situations that might otherwise lead to hopelessness and depression. But not all the prisoners could do this; some fell into a life-destroying bitterness, while others descended into passivity, hopelessness and emotional numbing. In all such cases, what was missed was the opportunity to grow deeper into a life of intense meaning. Only through meaning are we able to rise above what would otherwise be a hopeless situation. It is through such heroic attempts to embrace a life of meaning, rather than the pursuit of personal pleasure, that the Good Life consists. The suffering in the death camps presented the prisoners with the same choice each of you will face when confronted with suffering. Will you revolt against difficult circumstances into cynicism, hopelessness, passivity or despair, will you find ways to grow in and through the hardships to become a richer, deeper and more meaningful person? Some of you will not have fulfilling careers, happy marriages, and successful lives. Some of you will realize your dreams and others will not. Some of you may go on to live lives that, by worldly standards, are characterized by failure. This is not the message we usually hear in a commencement address, but I am not going to stand up here tonight and lie to you. I am not going to pretend that just because you have graduated from one of the best college prep schools in the world that now you can go on and achieve anything you set your mind to. Some of you will, some of you won’t. But what I can offer you is something of far more valuable than false hopes. When life knocks you about, when tragedy strikes, when you are facing dashed dreams and crumbling hopes, the choice to embrace a life of meaning still rests in your own hands. You can reach out and grab something far more valuable than happiness: you can embrace meaning. At the heart of a life of meaning is the decision to serve others with your gifts, your abilities and your life. In fact, a life of meaning often involves turning away from your own personal wellbeing to serve others. In one moving passage, Frankl told of those who, though starving to death, chose to give their last bits of precious bread to help others, and thus to realize the ultimate sacrifice of choosing to take up one’s cross for the sake of another. Through these acts of painful sacrifice, such prisoners were able to add a deeper meaning to what would otherwise be a hopeless and purposeless situation. “We who lived in concentration camps can remember the men who walked through the huts comforting others, giving away their last piece of bread. They may have been few in number, but they offer sufficient proof that everything can be taken from a man but one thing: the last of the human freedoms—to choose one’s attitude in any given set of circumstances, to choose one’s own way. …in the final analysis it becomes clear that the sort of person the prisoner became was the result of an inner decision, and not the result of camp influences alone. Fundamentally, therefore, any man can, even under such circumstances, decide what shall become of him—mentally and spiritually. …the way they bore their suffering was a genuine inner achievement. It is this spiritual freedom—which cannot be taken away—that makes life meaningful and purposeful…. An active life serves the purpose of giving man the opportunity to realize values in creative work, while a passive life of enjoyment afford him the opportunity to obtain fulfillment in experiencing beauty, art, or nature. But there is also purpose in that life which is almost barren of both creation and enjoyment and which admits of but one possibility of high moral behavior: namely, in man’s attitude to his existence, an existence restricted by eternal forces. A creative life and a life of enjoyment are banned to him. But not only creativeness and enjoyment are meaningful. If there is a meaning in life at all, then there must be a meaning in suffering. Suffering is an ineradicable part of life, even as fate and death. Without suffering and death human life cannot be complete. Frankl’s reference to the cross is interesting here, given that he was not a Christian. The cross reminds us that a life of intense meaning comes through the willingness to embrace of suffering, and to embrace a type of love that can only be known in vulnerability and pain. The cross shows us that the Good Life is found in weakness, in self-sacrifice and in vulnerability. I want to close by reflecting a little on this theme of vulnerability, because if we don’t understand vulnerability, we cannot properly understand classical education and its goals. Recall what I shared earlier from The Abolition of Man, where Lewis suggested that the purpose of education is the right-ordering of the affections, and the aligning of attitude with the structure of how reality actually is. It is worth reflecting that with rightly-ordered affections comes an element of emotionally vulnerable. As an example, consider civic virtues like patriotism and friendship. The feeling of loving one’s country is congruent to the virtue of patriotism, but with this disposition comes the possibility of emotional vulnerability if, for example, one watches his country abandons its ideals or become subject to defeat. These unpleasant feelings is something that a mere mercenary could never be vulnerable to. We can say that the stronger the virtue of patriotism, the more susceptible one is to unpleasant emotions in the face of his country’s destruction. Or consider the virtue of friendship. The feeling of loyalty to one’s friends is congruent to the virtue of friendship, but with this disposition comes the possibility of emotional vulnerability if, for example, your friend betrays you, or if your friend falls into pain and you are unable to help. The more you excel in the virtue of friendship, the more vulnerable you will be to heartache and sorrow. What is true of the civic virtues is also true of the artistic and intellectual virtues. When your eye has been trained to appreciate the finest art and your ear has been tuned to the greatest music, then you may be vulnerable to sorrow when witnessing the aesthetic relativism and artistic complacency that dominates so much of our contemporary culture. Similarly, to be inculcated in the intellectual virtue of being able to construct and identify sound reasoning and cogent argumentation is to be vulnerable to frustration and even sorrow when witnessing the crude sloganeering that dominates our public discourse. A well-educated person willingly embraces these unpleasant emotions, for part of what it means to be educated is to prefer such discomfort to ignorance. An educated person prefers the burden of knowledge and good taste to the satisfied complacency of ignorance. As philosophers have often said, it is better to be Socrates unsatisfied than a pig satisfied. It is the virtue of love that presents the ultimate vulnerability. This is something lacking in Aristotle’s account of the virtues and only really comes to fruition in the Christian tradition. For Aristotle, the perfect man is self-sufficient in himself, and so Aristotle conceives prideful self-satisfaction as a virtue. There is no humility for Aristotle’s perfect man. Jesus—who showed love through vulnerability, weakness and humility—falls quite short of perfection by strict Aristotelian standards. But even in the ancient world, we catch glimpses of this fundamental truth that there is a type of love that can only be perfected in and through vulnerability, and this emerges in Homer’s portrait of the hero Odysseus. In the Odyssey—and actually, in the Iliad as well—Homer portrays Odysseus as a well-rounded man who is both an excellent athlete as well as an excellent artist (recall that the most famous sections of the Odyssey consist in Odysseus telling a poem in the hall of the Phaeacians). He excels in the manly arts of battle both because of his great strength as well as his great intellect. He is tough but he is also sensitive. He has a disposition highly attuned to beauty. But he is not a god; he is a very human character, and with his humanity comes vulnerability. You remember that Achilles was presented with the choice to have a long peaceful life, but without glory and honor, vs. a life that will end in an early and violent death, but with much glory. Since Achilles is Achilles, there is only one acceptable option: to pursue glory and honor even at the expense of his own life. During his exile on Calypso’s island, Odysseus is given a variant of the same choice that faced Achilles. He can stay with the nymph and live the immortal life of a god—a life untroubled by hardship, want and the threat of death—or he can be true to his nature and pursue the things that have always meant the most to him: his wife Penelope waiting patiently for him, his family, his subjects and his true homeland. From one standpoint, staying with Calypso would have been the sensible decision, for when Odysseus chooses to leave Calypso for the things he loves, he is choosing to embrace vulnerability. He is choosing to live the life of mortality, with its promise of trouble, of slow aging and ultimately death. Recognizing this, Calypso reminds Odysseus of all the troubles that will await him should he choose to leave her. Remain here, she says, and you will be beyond the reach of death, and you can rule in calm possession of this dominion. The choice he is offered is that of transcending his human nature, and transcending fragility and pain with which that nature is associated. The choice Odysseus faced with Calypso is similar to the choice he faced when passing through the land of the Sirens. You recall that these woman-like creatures lured sailors off their course with their enchanting singing—music that is so beautiful that no man who hears it is strong enough to resist the fatal call. But Odysseus would rather make himself vulnerable to this beautiful music, despite the painful longings it will awaken within him, than to do the sensible thing and pass by with his ears plugged with wax. We might say that Odysseus is choosing the path of an unsatisfied Socrates. And you all know how the story goes: he commands his men to tie him to the mast with strict instructions to disobey the orders he will inevitably begin issuing once he falls under the spell of the Siren’s song. In the choice to make himself vulnerable to the beauty of the Siren’s music even though it comes with pain, and again in the choice to become vulnerable to aging and death by returning to the arms of Penelope, we catch a glimpse of a uniquely human set of priorities that characterized Odysseus. But with these values comes vulnerability. Odysseus chooses to pursue distinctively human virtues, including those that are inextricably linked to the vulnerability of mortal human experience. To pursue beauty is to be vulnerable, to love is to be vulnerable, and ultimately to be human is to be vulnerable. But with the fragility, limitation, pain and vulnerability of human experience comes the joy, beauty, and uniquely human values that gives our life its richness. As both Achilles and Odysseus realized in their different ways, to become invulnerable like the gods is to abandon all that makes human experience truly worth living. The gods themselves seem to recognize this. When the Greek gods fall in love, they fall in love with human beings. That which makes human beings vulnerable also makes them attractive and beautiful in the eyes of the immortals. Thus, the Olympians often leave their pristine heavenly existence in order to pursue a love mediated through imperfection and weakness. It seems as if that which makes human beings vulnerability also makes us loveable. Even with Calypso, the manly virtues that must have made Odysseus so attractive to her were those that the hero forged in the fires of hardship, of battle, of struggle and human vulnerability. In loving Odysseus, Calypso herself becomes vulnerable, as she experiences the pain of unrequited love. This tradition of gods condescending to the level of human vulnerability finds its greatest expression in the incarnation, where the Creator God embraced the vulnerability of human life and then the vulnerability of a painful human death. In the revelation of God in Christ, we are forced to confront the truth that was only partially glimpsed in the tradition of Greek mythology, namely that the highest form of love is one that is mediated through weakness, vulnerability and pain. All of you will go out from here, like Odysseus and like Christ, to experience pain, to shoulder burdens, and to live a life of risk. To be human is to be vulnerable to pain. To be human is to face difficulty. The choice each of us face is not whether we will face hardship, but whether we will do it in a spirit of courage, with rightly-ordered attitudes, letting pain perfect in us a life of intense meaning. All too often, however, we try to eliminate vulnerability from our lives by eliminating uncertainty, or eschewing the risks involved in living a life of meaning. The assumptions of our culture feed into this, since we have come to associate vulnerability with weakness. But Homer understood that vulnerability lies at the heart of courage, for a person who has accepted his vulnerability can put himself in situations where there is risk, uncertainty or the possibility of failure. Life affords continual opportunities for this type of courageous vulnerability. Consider how it takes both courage and vulnerability to open up when you might be misunderstood, to initiate when you might be turned down, to express need when you might be rejected and to love even when you might get hurt. As a defense against vulnerability, there is always the temptation of Stoicism. Stoicism originated with the Greek philosopher Zeno of Citium in the early 3rd century BC. Building on Zeno’s teachings, the stoics taught that the Good Life involves emotional indifference to the pain of the world. In teaching that each of us should submit to our fate with detachment, the Stoics provided a psychological buffer against the impact of emotional pain and human suffering. In Shakespeare’s play Julius Caesar, the character of Brutus is a Stoic. Thus, when grief gets the better of Brutus, he declares to his friend Cassius, “O Cassius, I am sick of many griefs”, Cassius replies, “Of your philosophy you make no use if you give place to accidental evils.” Cassius, though himself an Epicurean, is reminding Brutus to be a good Stoic and not be impacted by difficulties that only happen by chance (“accidental evils”). Brutus responds as a Stoic, saying, “No man bears sorrow better.” Later when Cassius latter expresses more sorrow than Brutus for the death of his wife, Brutus (having recovered his stoicism) tells Cassius to be quiet and speak no more of it. Stoicism invites us to approach suffering with a “stiff upper lip”, buffering us against the impact of emotional suffering. Instead of emphasizing the importance of rightly ordered emotion, stoicism offers an escape from the realm of unpleasant emotions. The problem is that when we make ourselves invulnerable to the emotional impact of the pain and hurt happening around us or to us, we are inadvertently numbing away the capacity to feel the rightly-ordered emotions that lie at the heart of virtue, including the ability to empathize, to feel joy, gratitude and love. Take these words to heart as you begin the next journey of life’s adventure. For the hard fact is that some of your lives may not be successful by worldly standards. Some of you may face pain, illness, divorce, death of loved ones, and on and on. But if you strive for meaning rather than happiness, then you will have the opportunity to realize a type of beauty that can only be known in pain, a joy that can only be known in vulnerability, and uniquely human values that are forged in weakness. 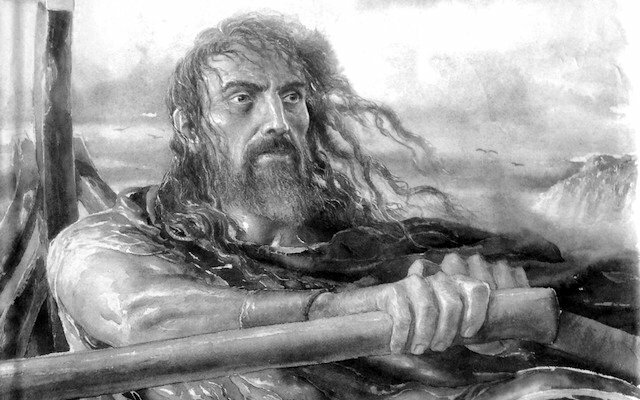 Be like Odysseus, who embraces a courageous vulnerability through his sufferings, exile and pain. Theodore Roosevelt talked about this attitude of courageous vulnerability in his famous “Man in the Arena” speech, which makes a fitting conclusion to this address. Roosevelt contrasted a soul that is cold and timid with one that can dare greatly, even if it means opening oneself up to the risk of defeat. This entry was posted in Aristotle, Classical Education, Education, Homer by Robin Phillips. Bookmark the permalink.